Why would Finance Secretary Hasmukh Adhia order to provide a manufactured Research and Analytical Wing (RAW) input in a sealed cover to Supreme Court against Enforcement Directorate’s (ED) Joint Director Rajeshwar Singh? The RAW input of 2016 which has now been proved to be a total fake says that one Indian citizen Danish Shah working in Dubai was in touch with Rajeshwar Singh and Danish’s wife is a Pakistani with links to Pakistan’s Inter-Services (ISI). The ED has already said that this was baseless and Rajeshwar Singh’s contact with this person is officially recorded for investigation purposes. Now Danish Shah has come out on the media and explained his position and his role in giving inputs to the ED and his interview in Sunday Guardian exposes the fraud of RAW’s Dubai officer who is close to Manoj Prasad, a relation of tainted Subrata Rai of Sahara Group. Dicey Hasmukh Adhia needs to answer why he did this fraud of producing an old manufactured RAW input against Rajeshwar Singh. The answer is simple: ED is going to charge sheet tainted former Finance Minister P Chidambaram in July when the Courts will re-open. The charge sheet filed against son Karti in Aircel-Maxis scam details the role of father Chidambaram and tells the court about ongoing interrogation of Chidambaram and is expected to file a supplementary charge sheet against Chidambaram soon. As per the Supreme Court’s Order, the Central Bureau of Investigation (CBI) also has to file a charge sheet before September 12. So what is the last way out for Chidambaram? Get Rajeshwar Singh terminated on grounds of National Security as he is the Investigating Officer of the Aircel-Maxis probe. This will frighten other officers also from touching Chidambaram. From 2011 onwards, this corrupt gang has been filing all sorts of fake cases against Rajeshwar Singh saying that he has amassed huge property and all allegations were found to be bogus by the CBI and the Central Vigilance Commission (CVC). After this in 2011, the Supreme Court has ordered protection to Rajeshwar Singh from these fake cases filed by the tainted Subrata Roy of Sahara and his paid journalists Upendra Rai and Subodh Jain. 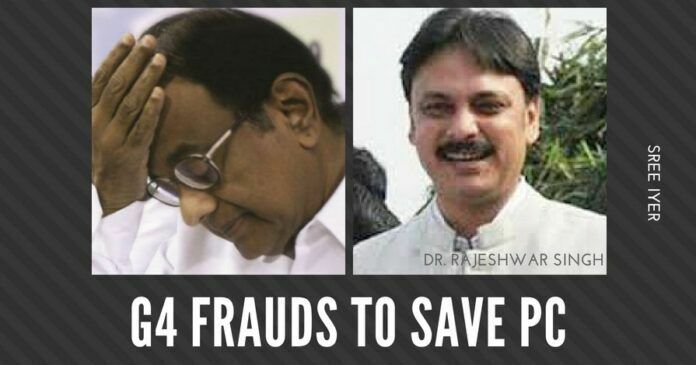 These three are now facing Contempt Charges from the Supreme Court (SC) for trying to sabotage the 2G cases by intimidating the investigating officers. Even after the NDA government came to power, Chidambaram was managing all cases with the help of his well-known buddy Arun Jaitley-led Finance Ministry. In October 2014, the Finance Ministry even lied to the Supreme Court that all probes in Aircel-Maxis scam were over and that there was no need for the services of Rajeshwar Singh in the ED! This blatant lie was told to the SC in BJP leader Subramanian Swamy’s case. In December 2015, Rajeshwar Singh unexpectedly raided Karti’s home and offices and exposed at least three billion dollars worth assets of the family in 14 countries and 21 undeclared foreign bank accounts. Hasmukh Adhia and his ex-deputy US Kumawat IAS played all tricks to delay the registering of cases under Black Money Act. The 2015 raid in connection with Aircel-Maxis scam exposed the INX Media bribery case also and led to Karti’s stay in Tihar jail. Those days the CBI Director Anil Sinha was a silent backer of Chidambaram and the situation was the same when Rakesh Asthana was heading the CBI’s Anti-Corruption Division in Delhi region. It is a million dollar question, as to why Asthana went soft on Chidambaram. The situation changed only after CBI Director Alok Verma vetoed him. The exposé of Sterling Diary shows that this Gujarat cadre officer accepted Rs.3.8 crores from Congress leader Ahmed Patel patronaged firms – Sterling Biotech and Sandesara Group. This shows how many cunning Gujarat cadre IAS and IPS officers straddle two boats – staying close to Prime Minister Narendra Modi and BJP President Amit Shah, while keeping good relations with Ahmed Patel too. Many such characters exist in this government. Subramanian Swamy has already declared many times that Hasmukh Adhia-led Gang of Four is behind the sabotage of anti-corruption cases involving Chidambaram and Sonia Gandhi’s son-in-law Robert Vadra. Swamy said he will on July 8 name the remaining three members of the Gang of Four. On Friday he tweeted that the second member of this Gang is a top CBI officer and he has already filed a confidential, detailed complaint against this officer to Prime Minister and his role in saving Chidambaram by terminating Rajeshwar Singh by hoisting fake cases. No need of superhuman intelligence to know that it is the controversial CBI Special Director Rakesh Asthana. Rakesh Asthana has managed to collapse many high profile cases. PGurus will soon do a series on how he engineered collapses in high voltage cases. In the Aircel-Maxis case, Asthana, who was in charge on 2016 and 2017 literally did nothing. The Aircel-Maxis case was revived only after Rajeshwar Singh attached the bank deposits of Karti worth Rs.1.5 crores in October 2017 which were ratified by the PMLA Adjudicating Authority and leading to the first charge sheet in June 13, 2018. After fixer Upendra Rai withdrew his complaint in May 2018 from the Supreme Court, the latest petitioner against Rajeshwar Singh was one Rajneesh Kapoor, who is a close associate of Jain Hawala case petitioner Vineet Narain. Narain started a Non-Governmental Organization (NGO) called Braj Foundation in Vrindavan. Braj Foundation is now mired in several controversies and PGurus will soon be publishing a series after reviewing copies of the court orders on allegations of land encroachments. It is a known fact that Vineet Narain is close with many Congress leaders including Chidambaram. Narain’s assistant Kapoor filed a case in the vacation bench of Supreme Court on June 5, the same day that Rajeshwar Singh was interrogating Chidambaram. Vineet Narain is in regular touch with Rakesh Asthana also. The petition was just a rehash of the old petitions filed by Sahara employees Upendra Rai and Subodh Jain. They just added an allegation that Rajeshwar Singh is “a threat to the sovereignty of the country”. And the Finance Secretary Adhia files manufactured RAW input on this case. The sealed cover was submitted by Additional Solicitor General Vikramjit Banerjee who was assisted in the Court by Government panel lawyer R. Bala, a UPA appointee and a known associate of Chidambaram. Adv. R. Bala was not supposed to land in this case, as he had represented Finance Ministry during UPA tenure against Rajeshwar Singh in Central Administrative Tribunal (CAT) and Delhi High Court. He argued for the exit of Rajeshwar Singh from ED and lost the case in all forums. This proves that all Chidambaram friendly and bribed guys have ganged up. Don’t the readers smell a conspiracy to save crooked Chidambaram, who is now proven to be the architect of fake Hindu Terror theory by cooking up a fake affidavit on Ishrat Jehan encounter to fix Narendra Modi and Amit Shah? Giving in a sealed cover a fake RAW input suggesting Rajeshwar Singh’s link with an ISI agent, was a brazen attempt to change the minds of Judges and arrest him under laws relating to national security. The crooked gang will go to any extent to save Chidambaram. Here the million dollar question is when Prime Minister Narendra Modi will fix these crooked persons in his Government. Our comments hold good provided they reach the people who are daring and caring for the national interest, involved in decision making at highest levels of law making, with unquestionable integrity, honest, loyal to national interest, duly supported by a national force. All political parties and leaders have vested interests and hence accommodate follies of each other. They are well supported by a few BABUs as well because they hail from the same society. There is a need to objectively screen BABUs and Political leaders for integrity, honesty, loyality, leadership qualities etc before being inducted into governance. This can be done by the same body which selects leaders for the armed forces. This method will ensure honest governance and transparency. Administrative methods of armed forces may be used to ensure scrutiny of decisions at various levels, so that flaws in the laws are highlighted whilst in the making and corrected before enactment. Hope some body will enforce such measures in the national interest. Arun Jaitely should be removed as Finance Minister. Instead bring an economist or Dr. Swamy or appoint Dr. Swamy as an Chief Advisor. Dismantle all useless ministries which are burden on govt for it need to pay salaries to the Minister & Babus in that department. What is the Education department doing ? Why iit is not working to improve mutual recognition to Indian degrees abroad in Australia or New Zealand, Germany & USA ? Modi’s silence in the matter is highly deafening. It appears all corrupt elements in the present and past govt. have ganged up to defend themselves and ordinary people can only be hapless spectators who can only vent their feelings in media columns and be satisfied with it. ofcoure, they can use the only weapon in their hands come next election. 7.MAKE GST SINGLE POINT FIRST POINT LIKE TDS TCS Remove all other forms and inspector raj. P Chidambaram will go to any level to save his skin. Prime Minister Modi should give stern warning to these PC facilitators in his Government. Narendra Modi should act and fix these crooks and save honest officers like Rajeshwar Singh and Ashok Khemka. All political personalities are same including Narendra Modi. They try to save each other and keep looting the poor people of India. Investigations/ Inquiry commissions are all eyewash. Divide and rule policy is what each political party and politician practice. Huge allegations (which are true by the way) are levied against each other before the elections to take political mileage and forgotten after the elections. We have all seen the fate of cases against Mulayam Singh, Mayawati, Robert Vadra, Raja etc. Karunanidhi family, dayanidhi maran family, chandrababu family benamies, jayalalitha, sasikala, EPS, OPS, yeddurappa and the bellary mining mafia, karunakaran and family in kerala, Mani and family in kerala, Pinarayi vijayan and the SNC Lavalin kickback, Narasimha rao and family frauds …….and the list goes on….how many of them were sent to jail?…….how many of the corruption trials were scuttled by deliberately putting up weak prosecutions….the whole system is a setup…when Nawaz Sharif could be thrown out in Pakistan just based on the panama papers we in India cannot prosecute a single politician who amassed wealth. BJP had brute majority in parliament, yet could not make any constitutional amendments or any laws on criminal justice to jail these politicians…..so depressing. After receiving hefty salary from Government and retirement benefits, if these Government Servants were to help tainted and looters to escape, it is nothing but betrayal of the country. These characterless insiders should be identified and eliminated to conduct corruption cases in a fare manner. If PM does not wake up even in the evening of the BJP Government, the prospects of BJP in 2019 will be bleak and only corrupt people will continue to be successful. DrSwamy seems to be leading a pack of honest,hard nosed no holds barred people with cajones to go after equally hard nosed outright crooks two timing this nation…Irresistible force going after hard well connected/entrenched objects.As a spectator,i want honest ones uproot entrenched crooks swindling this country.If some jokers who have carefully built up an honest image are thrown to the dust bin so be it. If you want a corruption free country then you must support ED officer Rajeshwar Singh who has not only been torchered by thses crooks but he is also suffering from the Bad decision forcefully taken by SC “favoring” PC and his Pawn. Being a citizen of India I will stand with every honest person and wud like to appeal to all Activists of India to file a bundle of fresh PIL before the SC to remove thses corrupt officials immediately so that the sovereignty and the integrity can breath. What intrigues is why is narendramodi sitting over it when it is quite evident that chidambaram is pulling strings through his aides in FM. Why is modi silent and how much more time will he wait. People’s patience is wearing thin and if he is waiting for the election time to get into action against these cheats it will be too late. The time for action is right now. It is now or never. Things are going from bad to worse and the wrong doers are getting bold by the day. Act fast modiji. Hinduism and India can be saved by NRI Hindus only, is a visionary statement given by a South Indian Swami. Prophecy is coming true. sree Iyer, Rajiv Malhotra, S Swamy ( preferred to fight with Indian base ) are few in limelight with contributions from many unknown NRIs. Few Hindu officers and politicians have surrendered to evil forces stabbing their motherland and no such cases are visible in Christian and Muslim countries. Very difficult to asses Modi’s plan. RSS trains people to love their country and do service but does not train to fight and Modi comes from such a school.With a cunning FM ( bed ridden ) and home bird HM, who control ED, IT , CBI and RAW, Modi hands are tied as these two politicians have made him PM and he never interferes in other ministries. This weakness has been grasped by few crooked officers having a kennel nature but have a feeling that Modi deliberately smoking the holes so the rodents come out and use the shoulder of S Swamy to neutralise them showing mirror to FM ( bed ridden ) and HM. After all it was Modi, who appointed one man army to RS. I think this article reveals the template of how the protection ecosystem works. I’m sure there is more to the template and you are also not revealing all that you know. Excuses, excuses, and more excuses. This is the impression one gets after reading this piece. Even a child in this country knows how high profile these cases are. Given that persons in high places are involved and knowing their ability to pull strings the authorities should have made sure that the cases are being fought studiously. Having failed to do so and offering excuses now doesn’t help. The central govt today is looking much weaker in fighting corruption at high places and already terrible damage has been done. This will cost them dearly in the coming elections. Very well written, you need to open a news channel, soon or at-least a youtube channel. Old articles are forgotten and new ones replace them as headings on website (Pgurus) but a youtube channel would have list of all videos and have a wider reach. This idea needs a SERIOUS consideration from Pgurus. Increase the reach and footprint to increase the awareness, put pressure on present dispensation to do the right thing by educating people and create more foot soldiers to serve our nation and people. Jai Hind! Bravo Sri Iyer ! Wish you all success as MSM has ganged up against Rajeshwar Singh to protect PC. Only you and Dr Swamy are fighting a lone battle for Mr Singh and have PC indicted and convicted. The noose is tightening, around the gatbandhan of Nehru- gandhis-vadras-chidambarams, bannerjs- yadavs- and other jihadis. Let us stay the course. P Chidambaram will go to any level to save his skin. But shame on the part of Hasmukh Adhia, Rakesh Asthana and ASG Vikramjit Banerjee to be part of this save PC racket. Prime Minister Modi should give stern warning to these PC facilitators in his Government. Narendra Modi should act and fix these crooks and save honest officers like Rajeshwar Singh and Ashok Khemka. Congrats to Subramanian Swamy for his untiring efforts to book PC and support Rajeshwar Singh kind officers. Does that imply Modi is still unaware of the misdeeds & malefactions of the Gang of 4 led by Hasmukh Adhia? Either Modi is hand in glove with these criminals – right from AJ to the Gang of 4 or Modi is under a tremendous black mail by these gangs on some of his weak points!!! Witness the Rajya Sabha proceedings wherein Ram Jethmalani is shouted down by Nirmala Sitaraman, M.A. Naqvi disabling him from exposing the names of Black Money Holders – obviously prodded by the rascal AJ. IT IS TIME RSS REPLACED MODI & HIS GANG WITH A MORE CREDIBLE & ENVIRONMENT FRIENDLY PM.